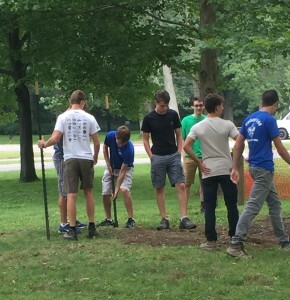 A group of scouts, including scouts from neighboring troops helped Max Cook complete his project at Water Works park. 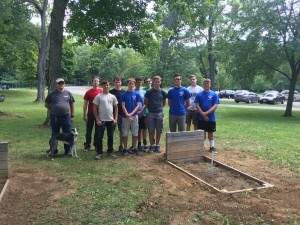 The project involved supplies from the city of Cuyahoga Falls as well as digging up dirt to place the foundation for a horseshoe pit. 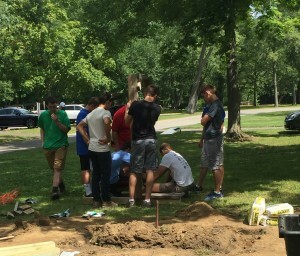 After the trenches were dug out to be level with the ground, concrete was spread to keep the planks in place. 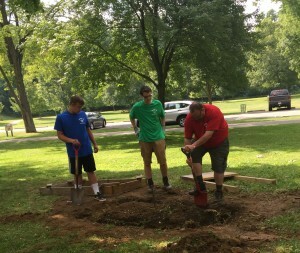 After the horseshoe pits (two in total) were placed where they were needed to be, the scouts then leveled the displaced dirt outside the horseshoe pit. 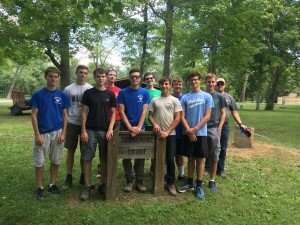 ← Congrats to Steven Neveadomi!